FREE PARKING! 11 am-6 pm, 2 hours, 6pm until closing, 3 hours at lot across the street. Private dining rooms for 18-55. Call 415-673-8300 Ext 1306. 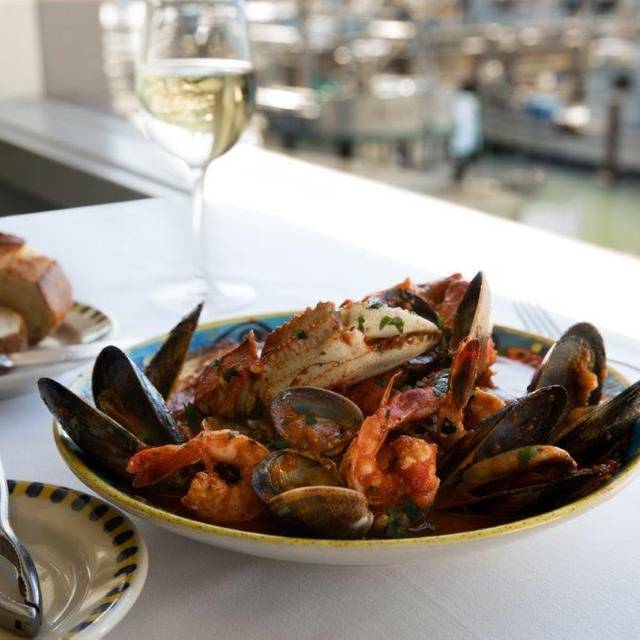 Alioto's Italian Seafood Restaurant is located in the heart of San Francisco's famed Fisherman's Wharf overlooking the historic fishing fleet and the Golden Gate Bridge. The Alioto family has been serving local seafood at the same location since 1925 making Alioto's SF's oldest family owned and run restaurant. The 3-tiered dining room offers every guest stunning views of San Francisco Bay, Golden Gate Bridge or the Wharf. 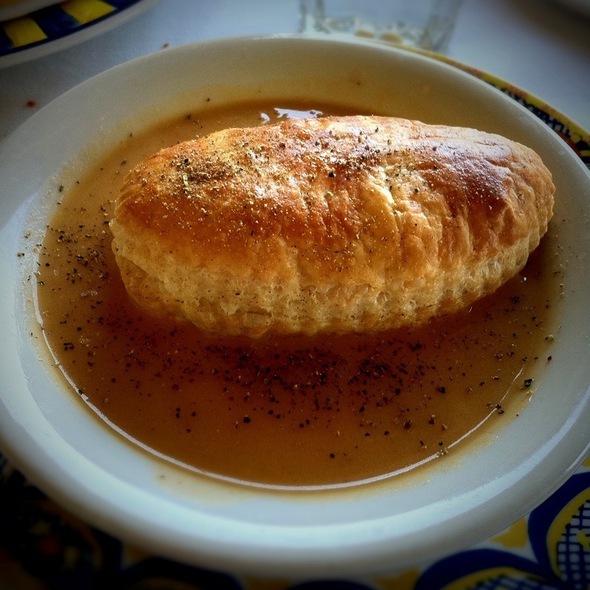 Alioto's menu features classics handed down through the generations. 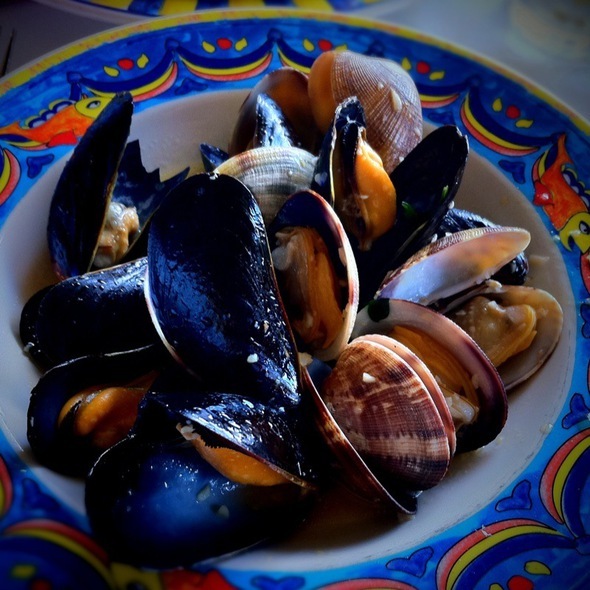 Try Matriarch Nonna Rose's world-famous cioppino, and Dungeness crab, always fresh. Also try San Francisco's Finest Calamari either light and crispy or our Sicilian style a family favorite. 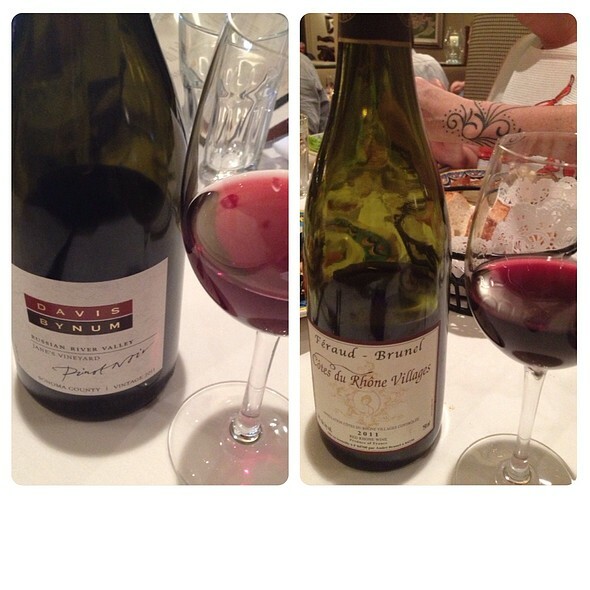 Wrath, "Pommard 4 / 77"
Great evening out! 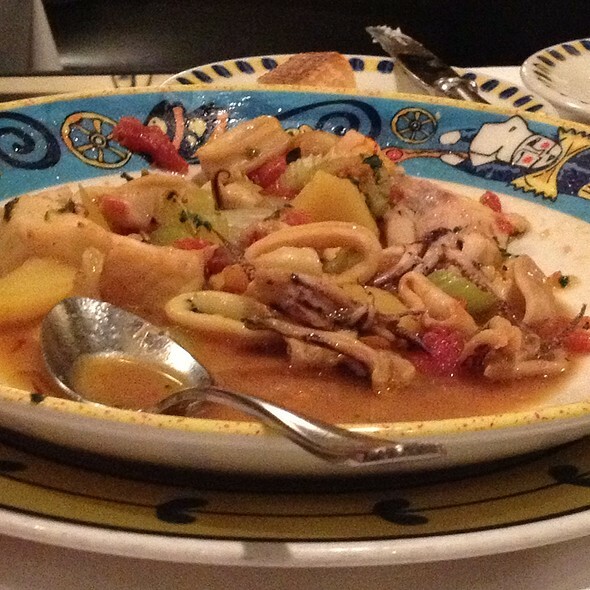 The food was wonderful and the service was excellent! The chowder is something you shouldn’t miss out on! We shared a bowl and it was perfect as a first course! Dear Alioto's, I am sorry to say I would not come back or recommend your restaurant to anyone. I have lived and dined in SF for the last 21 years and Alioto's would not survive outside the wharf and it's steady influx of tourists who will never return. We brought our daughter and a couple of her friends here with for a birthday celebration. Started out well, with the pleasant hostess providing us with a very nice table with ocean/sunset views. Thanks! From there it went down hill. Our server left us sitting for a while, forgot our drinks on more than one occasion and generally ignored us. Certainly was not what I was expecting from a family run establishment. Food was all over the map. Breaded calamari was good , Dungeness crab cocktail adequate, clam chowder was well seasoned and tasty. Do not order the Risotto. A pool of overcooked rice in a pool of liquid with seafood mixed in. Whatever it was, it wasn't risotto and was barely edible considering the cost ( we left half the dish, and I usually eat everything). The cioppinno was good not great. We ordered a half crab (that's was the reason to come to Alioto's, looking for a celebratory crab meal :) that was, well... steamed half crab. If reasonably fresh, pretty hard to mess up. So that's my take. Many other places to go... Sorry Alioto's we won't be seeing each other again. Definitely a tourist spot, but was VERY disappointed at the service received. It was very apparent the waiter was attending to other guests a lot more than our table (we were a party of 2). Everything we had we had to stop someone to ask for (bread, drinks, order, check) while others were being asked over and over if they needed anything. Have not experienced such bias in service in the Bay Area in a long time, but it was a good reminder that this type of behavior still exists. I will not ever patronize this restaurant again and will tell everyone I know to steer clear. RICHARD, THE HOST, GREETED US WARMLY AND GAVE US A NICE TABLE BY THE WINDOW. THE SERVER WAS EFFICIENT AND POLITE. ALL OF US ENJOYED OUR MEALS, AND I MUST ADD THAT THE SOUR DOUGH BREAD WAS DELICIOUS AND IT IS DIFFICULT TO FIND GOOD BREAD IN RESTAURANTS TODAY. We enjoyed a beautiful view of the sun setting while eating delicious cioppino. A wonderful experience every time! The oldest family owned and operated restaurant in San Francisco. 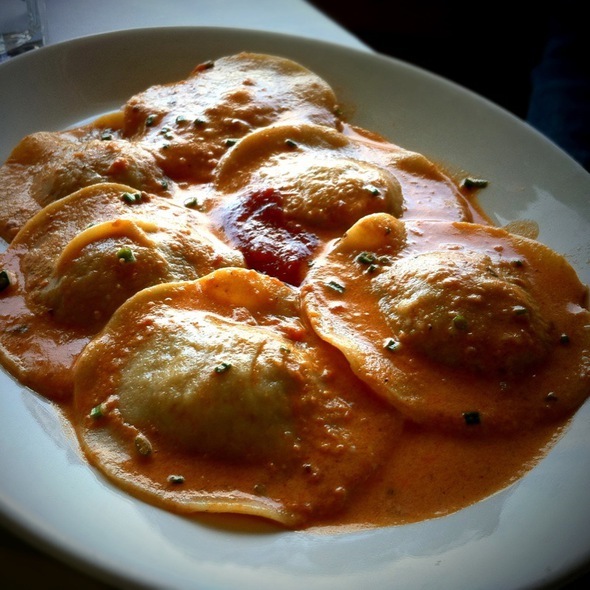 Good food, charming service, unbeatably San Francisco gem. If you shy away because you think it‘s just for tourists, please do yourself a service and check it out again. There are many of us San Franciscans who have rediscovered the place. You won‘t be sorry! Great service. Manager, servers, bat tenders always great people. Celebrating my 56 birthday. Enjoyed everything. What a treat, THE best crab in sf, great views, great service! The view alone is worth it, add great fresh food and attentive service to seal the deal. While their non seafood choices are more limited they do have something for everyone. Once you eat here you'll never go back to one of the chain restaurants at Pier 39 again! Awesome experience, awesome view,awesome food! Amazing! Great views, food was incredible, the martini was delicious! Perfect date spot. Our server was incredible also! Made us special items that weren’t on the menu. 100% will go back next time I am in the Bay Area. The food and service was amazing!! Highly recommended!!! Great service and wonderful views. Also very accompanying as we showed up with more friends. We live in SF & will come back. We love Alioto's. Excellent food, reasonable prices considering the view. We'll be back as soon as we can. Everything we wanted for our celebration of a special birthday! Boris our server was great!!! A true gentleman that knows how to accommodate his clients! Thank you for a wonderful experience!!! The Dungeness crab is a must! The best! Thanks Alioto!!! Best food and service I have had in the last 25 years! Manager even came over for 25 minutes and joked around with us. It was good. Much nicer than the restaurants around and seemed less touristy in a tourist center. Great view and delicious food. Bread was Boudin sourdough. Only drawback was slow food from the kitchen, but the waiter was good at keeping us informed about the delays. They probably need more kitchen help. Fantastic food, excellent service. Lovely view of sunset, as well. We arrived at Fisherman’s Wharf after a long flight from New Zealand. We were hungry and in need of a good sleep. I did a cursory web search for a seafood restaurant close to the hotel, and thought Alioto’s looked good. Little did I know, it is way more than good! My wife declared the seafood risotto as one of the best meals ever! And, we have dined in Italy. We returned for another meal two nights later. Service is just as good as the food, and so is the view of the harbor and bridge. The food was delicious. Our service was impeccable!! Been coming here for 4 decades and always a good meal with great service and amazing views. Top floor restaurant is much nicer. Still it is pretty expensive tourist fare. I have been a guest at Alioto's for 40+ years and this restaurant continues to offer a high level of hospitality and great food. 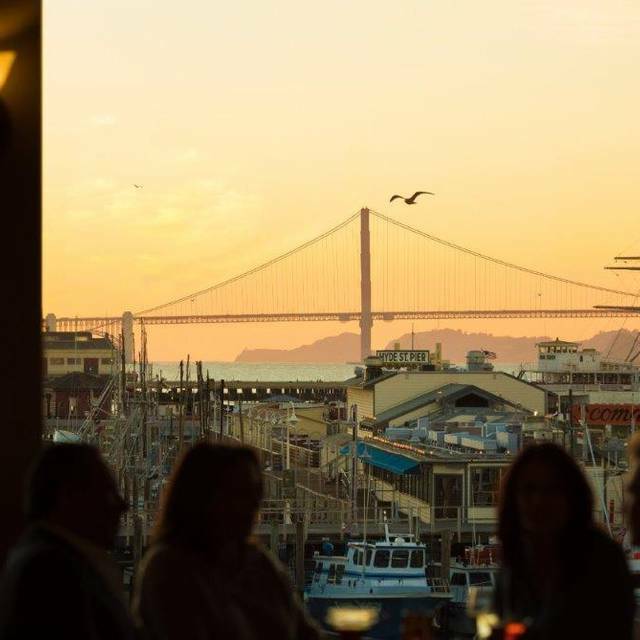 The view of the sun setting over the Golden Gate Bridge and the wharf make this restaurant a must-see for tourists and locals alike. 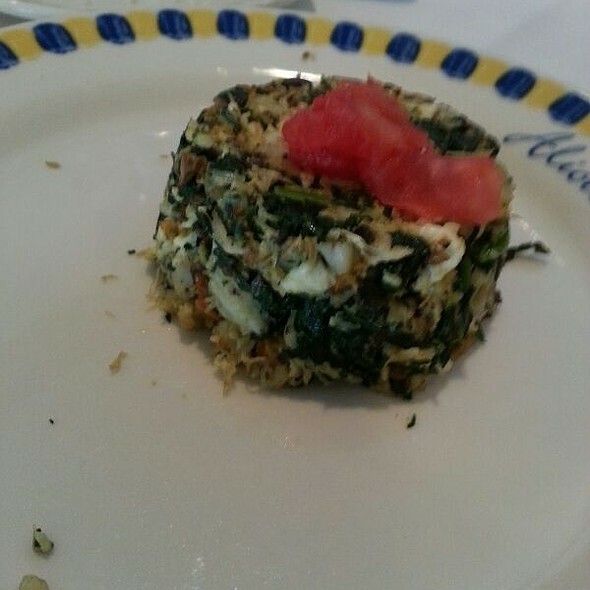 We had a wonderful lunch at Alioto’s restaurant. Started off with the best clam chowder in San Francisco! I had the Bay scallop creole with saffron rice. My friend had the rockfish pan fried with nice crunchy French fries complemented with warm sour dough bread. This was our first time at this venue, we definitely will be back when we return to this beautiful city by the bay! Great service and great food! Would definitely recommend! This is a old style classic Italian seafood restaurant with bow tie clad waiters and white table cloth tables. They do such a volume business right at fishermen’s wharf that subtlety and presentation are not their forte. We had a nice view onto the bay which made the evening- food was secondary. Friends were visiting from Argentina. Food was delicious, averaged priced, great service. Love the free parking. My girlfriend’s first visit to San Francisco and I wanted it to be a special night. 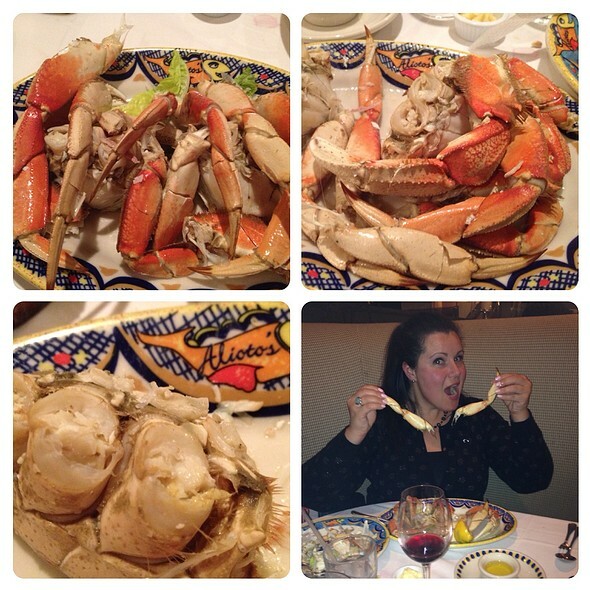 The team at Alioto’s did not disappoint. The service was impeccable, friendly and efficient! The food was delicious, the service outstanding, however I couldn't get over the smell of fish that permeated the restaurant. I realize this is a seafood restaurant right by the pier, despite this I would return. We really enjoyed Pavel, our server. He was entertaining, professional and very knowledgeable about the food choices. Our food was excellent and the view of the sunset over San Francisco Bay sublime. We always are happy when we go here!